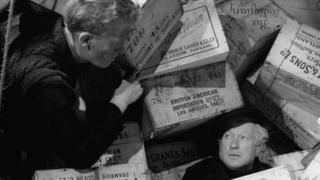 Thèid dreach ùr den fhiolm Whisky Galore a shealltainn air an oidhche mu dheireadh de dh'Fhèis Fiolmaichean Dhùn Èideann. Tha am fiolm stèidhichte air an leabhar ainmeil aig Sir Compton MacCoinnich agus thèid a shealltainn aig deireadh na h-Òg-Mhìos. 'S e seo an dàrna fiolm a chaidh a dhèanamh a tha stèidhichte air an leabhar. Chaidh a' chiad fhiolm a chlàradh ann am Barraigh ann an 1948 agus chaidh fhoillseachadh bliadhna às dèidh sin. Bhon uair sin, thathar air faighinn anns na Stàitean Aonaichte fon ainm "Tight Little Island" agus san Fhraing fon ainm "Whisky à gogo". Ach tha barrachd fhiosrachaidh air tighinn am follais mu na thachair dhan SS Politician ann an 1941 anns na bliadhnaichean bho chaidh a' chiad fhiolm a dhèanamh agus 's urrainnear na seallaidhean àlainn a shealltainn ann an dathan san là a th' ann. Le sin tha an fheadhainn a tha an sàs anns a' phròiseact den bheachd gum biodh e iomachaidh fiolm ùr a dhèanamh. Thèid am fiolm a shealltainn Didòmhnaich an 26mh an t-Òg-Mhìos aig Fèis Fiolmaichean Dhùn Eideann.